There are those who feel that electric powered washers aren’t that good when it comes to wiping out dirt and stains on your car or driveway.Then there are also those who argue that gas powered washers are not only overpowered but they’re also environmental hazards. The newest innovation from Black max.This rugged and versatile electric pressure washer is a great alternative to using gas.With 1700 PSI this pressure washer will wash a number of items including patio furniture, grills, windows, cars and a number of other residential items.Mobility and durability should never be a problem as well.The 7” wheels,although made from plastic,are extremely durable.Coupled with the aluminum frame and the pump itself,you’ll get a machine that’s made for rugged and dirty environments. This pressure are nowhere near as expensive as your typical gas powered machine. There are compromises for this though and as discussed earlier it all boils down to performance. You can’t expect this machine to plow immediately through the pile of dirt,moss,algae or whatever stains you might find on your driveway. Although results are not instant, Blackmax guarantees that you will get them. 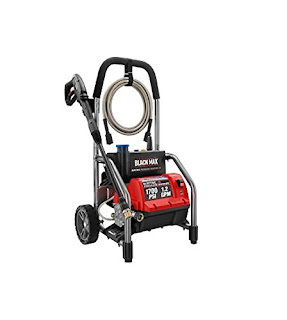 This product comes standard with a on-board detergent tank,rugged roll cage frame that will not tip over, a durable maintenance free aluminum pump and a BONUS $20 turbo nozzle for 50% more cleaning power.After seeing this item, you will never look at Electric Pressure washers the same way again!For its price the performance of the Black Max pressure washer is more than acceptable. It’s not really going to knock your socks off and you’ll probably get flak for buying a machine that’s so underpowered by expert’s standards.These things should not discourage you though. Ultimately you’ll realize that you’re going to get far more savings from this Blackmax BM80721 pressure washer compared to one that has a 4000 PSI output. Should you reach a decision to buy these online stores like Amazon currently have it at $179.99. It’s definitely a steal considering its price.